On this blog, we have featured many parasites that drastically alter the appearance and/or behaviour of their host, usually to make them more likely to be eaten by the next host in the parasite's life-cycle. But today, we are featuring a parasite that makes their hosts appear less appetising - a seed parasitoid that has other plans for its host - none of which involves being eaten. From the perspective of the plants that produce them, fruits are a way to turn animals into willing seed couriers. By wrapping seeds up in a tasty package, plants can deposit their seeds temporarily inside the body of an animal that will carry them off to a new location. We have even featured a (parasitic of course) plant on this blog that uses beetles for such a purpose. Unlike the rest of the plant, which is often indigestible and laden with defensive toxins, the fruit is supposed to be attractive and appetising to would-be animal dispersers. However seed parasitoids such as Macrodasyceras hirsute have other plans for the fruits - they do not care for the fruit's flesh - they are only after the nutritious seed. Unlike the parasite we featured in the last post, the gullet of a bird is a death sentence for the larvae of this parasitoid (though as always in nature, there are some exceptions), which is a bit of an inconvenience as the fruits it parasitises are meant to be eaten by birds. Macrodasyceras hirsutum parasitises the fruit of the mochi tree Ilex integra and all it wants to do is to live out its larval stage munching on seeds and grow up to be a wasp. It would rather not have its life suddenly interrupted by a hungry bird feasting on the mochi tree's bright red ripe berries. So to ensure that its home will not end up tumbling down the throat of a bird, M. hirsutum larvae counteract the berry's usual ripening process, and ensure that it stays green (and unappetising to birds, which disdain unripe berries). A team of Japanese scientists found that if they shielded the fruits from wasp attack, almost all the mochi berries ripened to red. But, if they are exposed to M. hirsutum, some of them stayed green, and all the berries that stayed green had M. hirsutum larvae living inside them. Furthermore, they found that the more larvae there are in the berry, the more intensely green the fruit becomes - M. hirsutum did not merely stop the berries turning from green to red, they actually turned the dial on the green tone all the way up. This little wasp is not the only insect to do this. Holly berries infected with a species of midge also stay green. It is unknown how this wasp interferes with the berry's pigment production/development, though for the holly berry midge it has been suggested that a symbiotic fungi is responsible for maintaining the host fruit's green colour. The relationship between fruit-bearing plants and fruit-eating animals has evolved to be a mutually beneficial interaction whereby one party provides food (fruits) while the other returns with a service (seed dispersal). But, the actions of M. hirsutum and other such seed parasitoids tinkering away in the background can certainly undermine the effectiveness of this mutualistic partnership if they cause otherwise ripened fruits to go uneaten. The extent of the impact such seed parasitoids have on the ecology and evolution of such plant-animal interaction is currently unknown. Takagi, E., Iguchi, K., Suzuki, M. and Togashi, K. (2012) A seed parasitoid wasp prevents berries from changing their colour, reducing their attractiveness to frugivorous birds. Ecological Entomology 37: 99-107. Today's post has some plant-on-plant action, featuring a species of dodder. Dodders are a group of holoparasitic plants made up of about 100-170 species. They are plants that consistent entirely of stem, with leaves that have been reduced to tiny scales. They smother the host plant in a tangled mess, and dig deep into the host tissue using modified roots called haustoria to draw out water and nutrients. 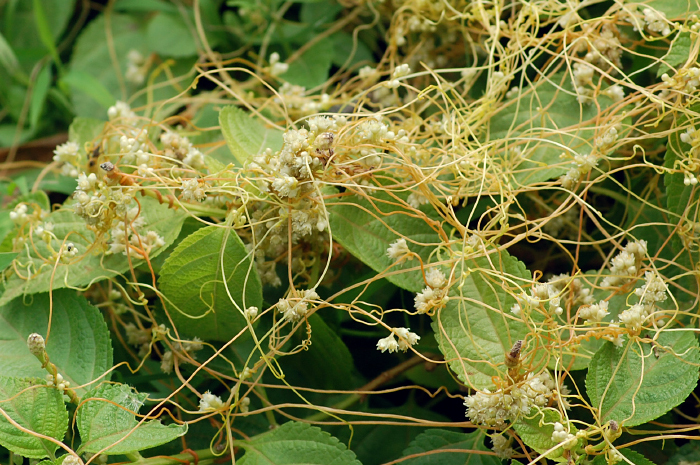 We have previously featured the European Dodder on this blog, but today, we will be looking at the Chinese Dodder Cuscuta chinensis, and how it interacts with plants that are not native to its home range. There are many studies that look at characteristics of successful invasive species (an introduced species that has subsequently become a pest). Generally, plants that have become invasive after their introduction have faster growth rates and are able to utilise nutrients more efficiently, allowing them to outcompete the native flora. In addition, according to the "enemy release" hypothesis, one of the reasons why newly introduced plants and animals become so successful in their new homes is because they are freed from the burden of their natural predators and pestilence, thus allowing them to propagate unchecked across the new land. While this seems to indicate that the best way to control invasive species is to introduce their natural enemies as well, the main problem is that you are introducing yet another new species. Remember that folklore about the old lady who swallowed a fly and subsequently introduced a sequential menagerie into her body? You don't really know what cascading effects the new biological control species will have on the local ecosystem - after all, the cane toad (Bufo/Rhinella marinus) was introduced to Australia to control beetles in sugar cane plantations, but have since become a huge ecological problem. The higher growth rate and resource-usage efficiency of these invasive plant does have a drawback though - it makes them more attractive targets to parasites. So what if a native parasite can turn the table on the invaders? What if a native parasite acquires a taste for an exotic new host? 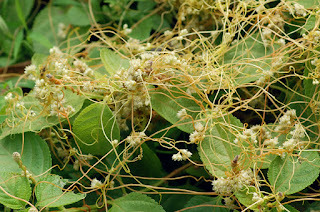 The Chinese Dodder is a parasite with eclectic tastes, as it is capable of infecting more than 100 species of wild and cultivated plant species. To find out how well C. chinensis grows on native flora compared to their introduced counterparts, a team of researchers in China evaluated the performance of C. chinesis on 3 invasive plant species and the native equivalent from the same genus. They found that not only did C. chinensis grow much more prolifically on the introduced plants,but it also caused more damage. In fact, C chinensis is more damaging to plants that are more efficient in using their resources - the very trait which makes them so good at being invasive in the first place. There is also another possibility - one which the researchers did not mention in the paper: Unlike the native plants which have had a long co-evolution history with the dodder and have thus evolved various means to counter the parasite's tricks blow-by-blow, the naive introduced species have never encountered C. chinesis before, which leaves them more vulnerable to attacks by the parasitic dodder. For those exotic introduced plants, it seems that the very thing which had brought them so much success in their new home may end up causing their downfall when confronted with a certain holoparasite.